Keep Track of Your Blood Pressure and Offer Yourself Peace of Mind with a Reliable, Manual Blood Pressure Cuff by Paramed! Are you tired of untrustworthy, cheaply made blood pressure devices that increase your anxiety, instead of offering accurate readings? Would you like a high quality blood pressure cuff that you can easily use at home, whenever you feel the need? Then this Paramed sphygmomanometer is for you! 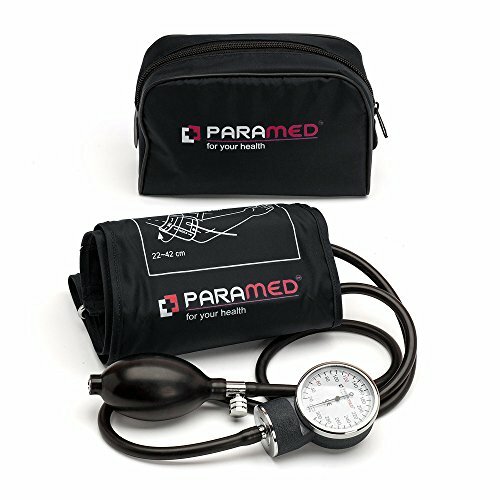 Protect Yours and Your Family's Health Whether you need to monitor your blood pressure daily or want to have a high quality, accurate blood pressure cuff handy for any occasion, this professional aneroid sphygmomanometer is a must-have for any household, especially in homes with hypertensive or hypotensive patients. Trust In Professional, Clinically Calibrated Results The Paramed aneroid manometer offers the safest, most reliable solution for highly accurate, clinically calibrated blood pressure readings, every time. The long, universal cuff (22-42cm) is made of durable materials that are comfortable to use in any body type (from slim to obese), while its easily readable, clear dial with large, discernible numbers makes it ideal for the elderly or people with low vision. Blood Pressure Measuring Has Never Been EasierEquipped with an easy to use, air valve mechanism that can be operated with just your thumb, this manometer makes measuring your blood pressure a breeze! The kit comes neatly packed in a comfortable, blue, nylon carrying case for increased portability and safe storage, when not in use. Backed by a 30 day money back guarantee, you have nothing to lose! Order Yours Today and Take Your Health Into Your Hands! If you have any questions about this product by Paramed, contact us by completing and submitting the form below. If you are looking for a specif part number, please include it with your message.